We made quite a bit of kitchen progress this weekend. The internet may not have enough room for me to write everything that happened at the Hummel house during those few short days, but we have the highlights here. If you are bored and only care about my kitchen progress, just scan down and watch the video at the end. Of first importance, our lovely friend Jenny came. Taking extra time off of her job at Hillsdale, she drove hours and hours alone to help me with hard manual labor for the whole weekend. When we first met in a freshman dorm, Jenny and I knew we were kindred spirits because we both grew up helping our dads build things. Our friendship deepened on a ride to Wal-Mart where we discovered other mutual passions like hot tea, well-raised children and traditional hymns. From there we led a small group Bible study together and served on a Christian students leadership team before living in the same dormpartment for senior year. So yes, we dissected various aspects of the royal wedding (the folds in her skirt extending to the train of the dress! trees in the church! such a tasteful bouquet!) and chatted about life and love while sharing deep thoughts and feelings during our visit, but we both have know-how when it comes to things like hammers, circular saws and power sanders so we made the most of our unusual similarities with my kitchen project. 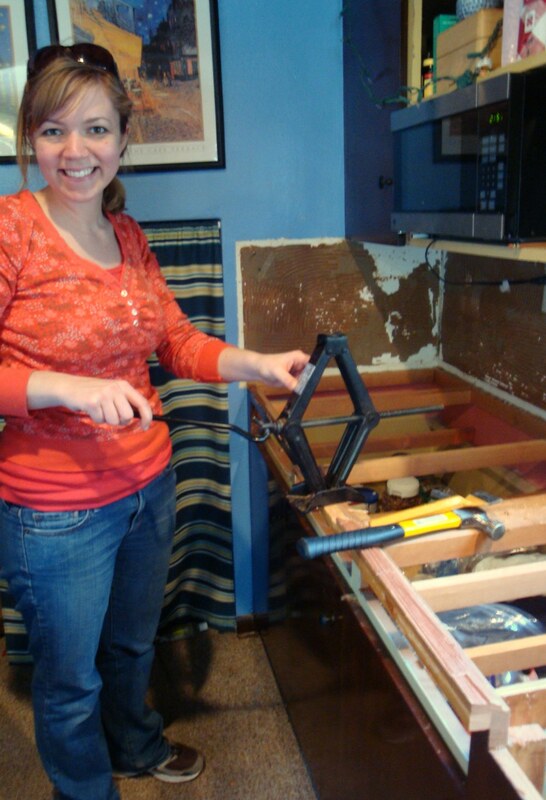 I don’t know many women who would take time off from work and spend a full day driving to help a friend demo and rebuild part of her kitchen! Jenny is truly one in a million. 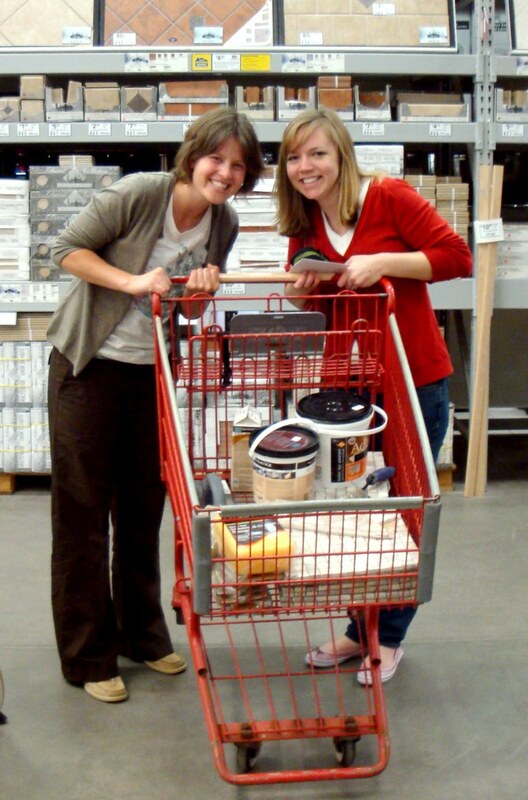 Our first adventure included a trip to Lowes on Friday night… Finally! After six years of friendship we could do a project together! All the male employees asking if we needed assistance as we filled the cart with materials needed for our weekend plans. I suppose it’s not every day they see two giggling girls loading a cart with porcelain tile and comparing circular saws, so we can’t blame them for offering to help. We bought everything we needed for installing my tile backsplash. There were a few things that needed to happen before the tile could go up, but these challenges seemed more exciting than insurmountable. The old countertop? Oh, we’ll rip that bad boy out, easy. The sink? It gets a little tricky, but Aaron can help us. What else could stand in our way? Please, try to stifle your laughter. We were doing the best we could and our first evening of ignorance was blissful. so easy! I could demo kitchens for a living! 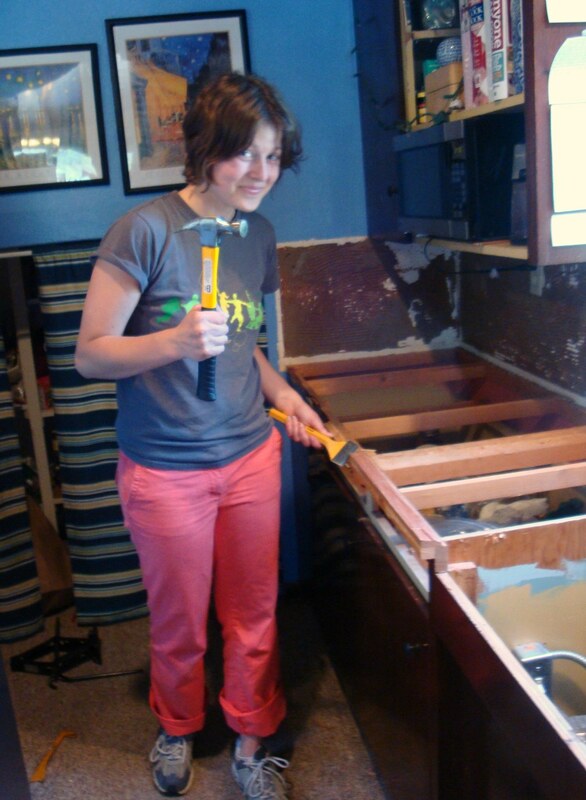 Then we had to start pulling the wood countertop off the cabinets. This was more difficult than the ease with which we pried off the laminate cover. There was a little swearing (all me) and for a time I tried to convince myself I could leave the counter as-is, add some oil and call it butcher block. 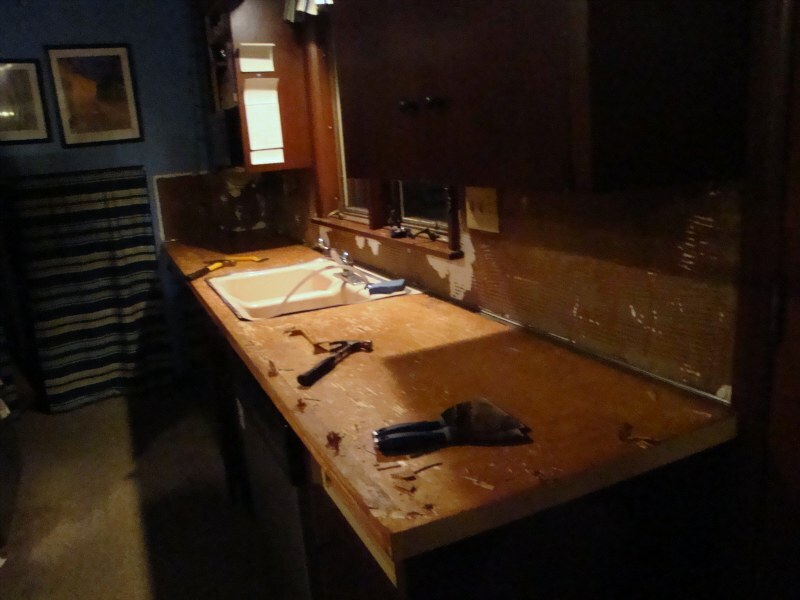 But the lovely faux-granite counter was already sitting in the basement and we were at the point of no return, so somehow we managed to press ahead with the demolition. 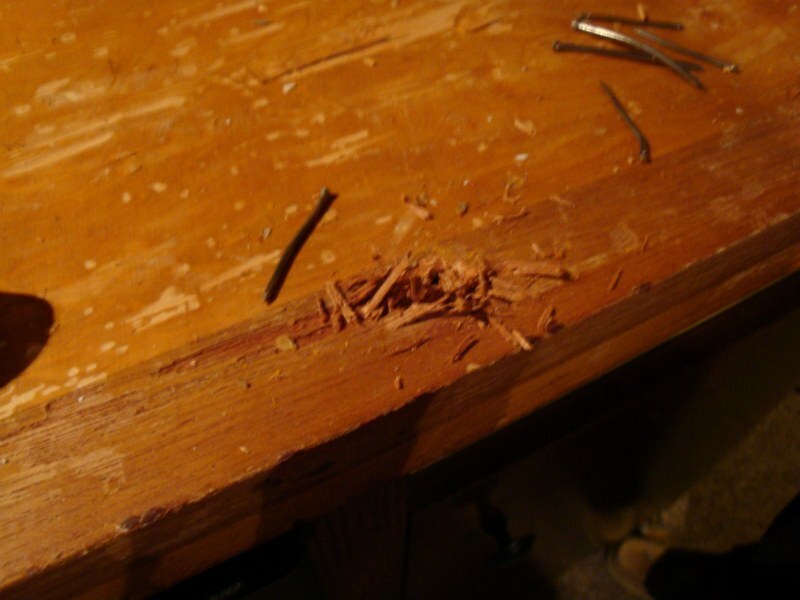 The wood was secured with glue and finish nails, so Jenny dug around with one of my little tools and got the practically-headless nails removed… What a woman. After the nails were out, it was time to remove the pink sink (oh happy day!) and get the counter up and out. We were planning to use my car jack to get extra leverage since the counter was so heavy and long. 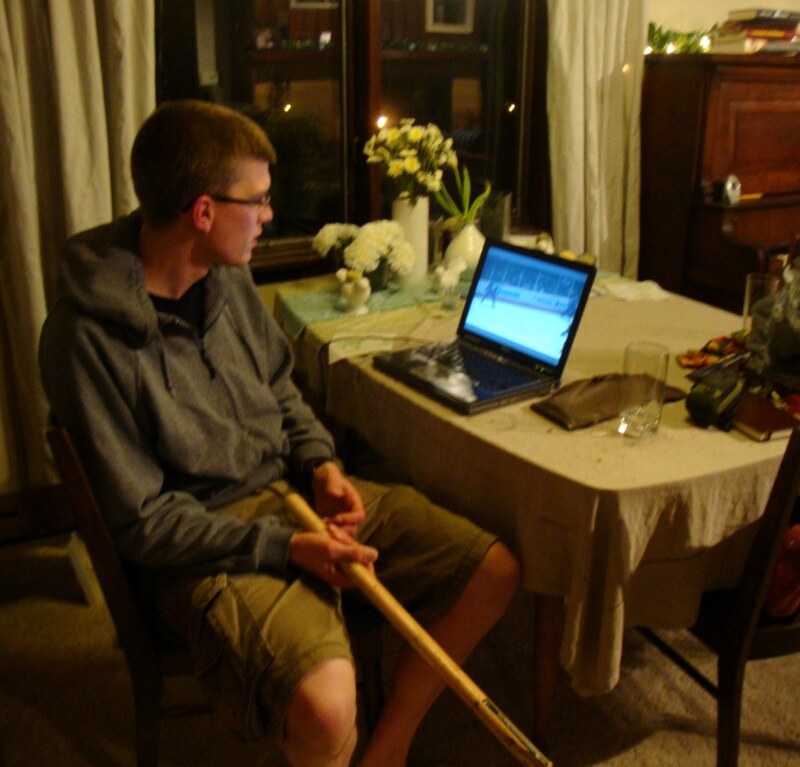 Aaron customized the length of an old, splintered axe handle for this undertaking. He wanted to hold it while watching hockey. Perhaps it felt like a stick in his hands, making the game all the more real to him. 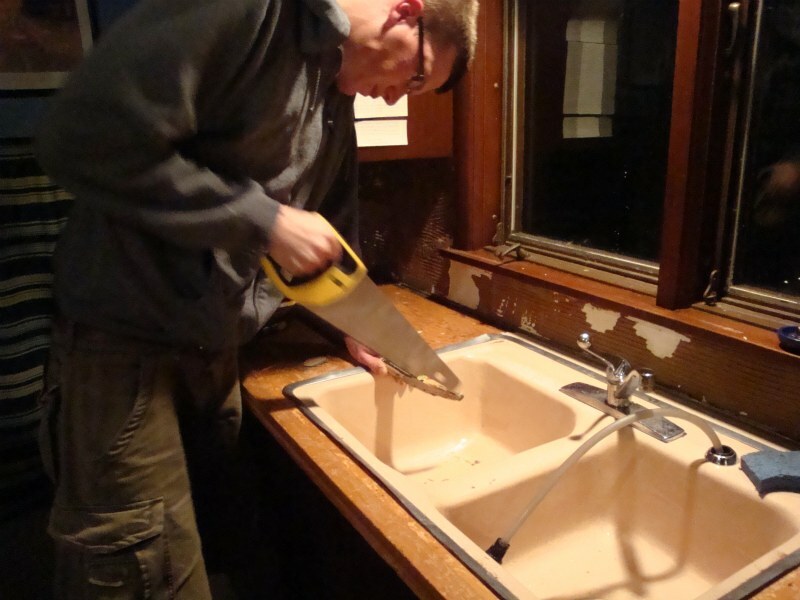 So with Aaron’s help we disconnected the plumbing, ripped out the sink, and then we were able to pry up the old counter. I’m not going to lie, it was a difficult and crazy job. Jenny was a demolition beast. She has such a way with crowbars. You will see behind her the jack from my car. We used this to pry the counter up and it was amazing. We used the custom-length axe handle and got it right up under the edge of the counter. Twist, twist, twist, pop! The counter creaked off and we were able to take the whole thing out to the backyard in one piece. I imagined this process taking fifteen minutes. It actually took a whole day. this was an excellent trick! It was a very busy weekend, but we were so blessed to have Jenny with us. We are so grateful for the self-gift that she was to us during the quick trip. There are very few things as precious as time spent with a dear friend! I will have more pictures of the finished counter and tile backsplash soon! I pity the fool who tries to take off the counter we so laboriously installed! Here is the basic gist of this post in video format. I love how Aaron turns on the circular saw as if on cue when I’m talking about the support and shims he was cutting. There is also a preview of the tile we chose, and I mention that Aaron found our sink on the side of the road. That’s right folks, somewhere in the UP of Michigan, he got this baby for fa-REE. We are unashamedly frugal. Unashamed! What a project! Mostly I’m curious about your thoughts on trees in church! Wow! That looked like A LOT of hard work! You should have asked Justin for help!! He has experience ripping off countertops! I’m so impressed with your documentation. Yay for getting to do a project together! Thanks guys! My thoughts on trees in church are all from my inner Martha Stewart, appreciating the decor in Westminster Abbey for the royal wedding last weekend. In this instance, I’m not really sure if there is a deeper theological significance to bringing potted plants in a sanctuary. But since the question has been asked, I thought it was very tasteful. It looked like a great way to keep a light “garden wedding” feel to the service even though it was in one of the most celebrated formal ceremonies of the decade. I also really want to eat some of their wedding cake, but I would not have been willing to wear a ridiculous hat in order to do so.